Meet Mare, a grandmother with flair and a fascinating past." Octavia and Tali are dreading the road trip their parents are forcing them to take with their grandmother over the summer. After all, Mare isn't your typical grandmother. She drives a red sports car, wears stiletto shoes, flippy wigs, and push-up bras, and insists that she's too young to be called Grandma. But somewhere on the road, Octavia and Tali discover there's more to Mare than what you see. She was once a willful teenager who escaped her less-than-perfect life in the deep South and lied about her age to join the African American battalion of the Women's Army Corps during World War II. Told in alternating chapters, half of which follow Mare through her experiences as a WAC member and half of which follow Mare and her granddaughters on the road in the present day. I really enjoyed this book! The character were totally relatable and Mare is the coolest grandmother ever (don't call her that though!) The title of this blog post/review is kinda random, but reading this book made me think of my grandmother and how I haven't talked to her in forever. So I'm going to call her today! The title is a reminder that grandparents need love so call 'em up or hang out with them! They may actually have some cool/funny/interesting stories to share. That's one thing I learned from this book. You presume your grandparents haven't really lived life, they're just old. But they have stories too and while they may not be as interesting as Mare's (or may be even more interesting! ), you never know unless you ask. So call/them or hang out and ask away! The historical aspect of the book was really enlightening. Before reading this book, I knew absolutely nothing about the role of African American men and women in WWII (except from what I'd seen in Miracle of St. Anna which was more fiction than fact). The information was really interesting and I admired the black men and women who fought for the U.S. even though, the U.S. wasn't very appreciative. It would have been really hard for me to go to Paris, help fight to protect the U.S., see how kind and non-discriminatory the French people were and then go home. I probably would have stayed in Paris. The work of the WAC (Women's Army Corps) is something I intend on reading more about. Also, I'm going to find some WWII movies about black soldiers (I think Denzel was in one :D). I also liked both sisters; Tali and Octavia. They were both a little annoying sometimes. Octavia because she was so timid, Tali because she was so rude and whiny. But I sympathized with Octavia's struggle with driving (I'm learning to drive too. And it's scary fun!). And I would be mad like Tali if I couldn't listen to my music. I also like how Tali was stubborn and didn't take no mess from anybody, like Mare. If you like historical or realistic fiction, this is a must read! 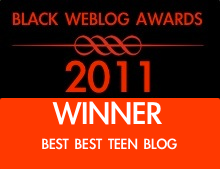 Actually I think everyone should read this, because we African American teens need to know all aspects of our history. I would say high schoolers and middle schoolers could and should read this book. Love your review. 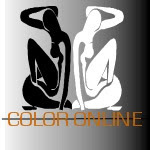 Do you know if you submit reviews to Color Online and we publish your review your name is entered in a drawing for a book of your choice from our prize bucket. We happily will publish previously published reviews so when this falls off your front page, we would publish your review and link back to your blog so readers can check out more of your posts. I know its a little late but welcome to the blogger world. This blog makes me very very happy. 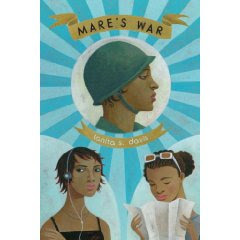 I really enjoyed Mare's War as well. The grandmother was great. Wow, this sounds excellent. I just ordered a copy for my niece. Have you been to Tanita's blog? She's really cool. Drop her a note. What a wonderful review! How lucky the blogging world is that you have started contributing! Miss Attitude! Thank you so much for your review! I feel honored that my book held your attention, and you know you ought to call your grandmother, just so she can fill you in on what she was up to back in the day! Here's to finding out more about our people and our past -- and to fueling our future. Thanks everyone for the words of welcome! thank you for the love. griotgirl I'm so glad you ordered the book for your niece. I bet she'll really enjoy it! Let me know. Mrs. Davis you've inspired me to look more closely and learn more about our history. 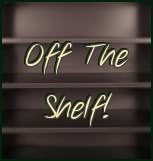 Please check out and post your responses on your blog for Susan's Unofficial List of Great YA Literature by or About Women of Color. See also my GoodReads to-read list, since I own almost none of the books on there. If you own any of these books and want to trade for them (or just give them away! hee hee) then please contact me! This list is in no particular order. I prefer to review YA books about people of color. 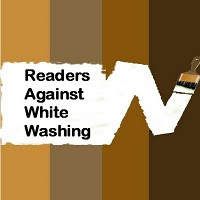 Occasionally, I will review a book with a white main character, but odds are, that I will decline. However, I do NOT review blog novels or e-books. Sorry! Furthermore, I will ALWAYS review books honestly so if you only want a positive review, that's not me. I blog with integrity. 4/5=Excellent. Great read. Strongly recommended to read. 3/5=Liked it. Good characters, plot, etc. Read it if you want to be entertained and aren't very nitpicky. 2/5=Decent. Hit or Miss. If you see it, read it, but don't go out of your way to look for it. Don't read if you only like really, really good books. "IQ" stands for Incredible Quote. It's one of my favorite lines from the book. I pick one that really stands out, whether it's funny, inspirational or deep. "Off-Color" a review of a book that does not have a poc in it. These will be rare and far in between. Uusally they will have a poc as a secondary character or be authored by a poc even if the mc isn't a poc. New crayons + Last Day to Sign Up! 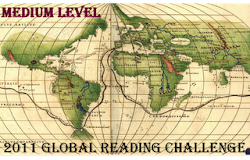 2010-2011 Middle East Reading Challenge! 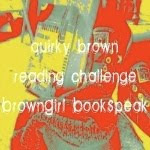 2011 Quirky Brown Reading Challenge! Nancy Drew and the Hidden Staircase Blu-Ray Giveaway! The Electrical book cafe...and more! CLG Is Moving to ChickLitGurrl.com! My essay is up at THE TOAST! And they lived happily ever after. The End. Fortune's Pawn by Rachel Aaron, I mean Bach. Book Event: Brave New Teenagers featuring...me! Interview with ‘A’ from Pretty Little Liars! Living Your Five gets a new home! silver phoenix: beyond the kingdom of xia, by cindy pon. Win an ARC from I Should Be Writing with multiple winners! Books, Movies, Reviews! Oh My! Mid-March news: ARCs! 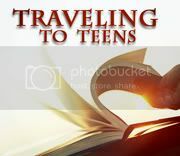 NYC Teen Author Festival! Cynical, Ornery, Sublime, Lush . . .